By far the most common ground used is a one-year separation. The separation agreement is a binding contract that is there to help you set out how you should deal with each other now that your marriage is over. Most couples try to do this through negotiation or through a mediator. At the end of the separation, you are granted an uncontested divorce. If the divorce is contested and mediation has not resulted in an agreement, then all aspects of the separation will instead be decided in court. While entering the courtroom may be necessary in a few cases, such as those involving domestic violence, in reality, the court process is usually exhausting and very expensive. Custody disputes in particular can become very destructive. Most clients settle partway through the process and very few cases go to trial. 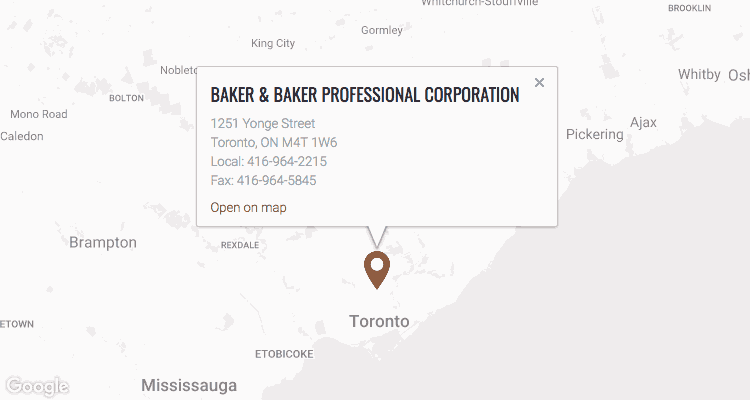 As an overall game plan, at Baker & Baker, our Toronto divorce lawyers try to negotiate a separation agreement and avoid going to court. Our hope is to get our clients through the process as quickly and inexpensively as possible. It is much better to come to an agreement privately with the help of a mediator or lawyers, so that you can work out your own agreement without an outside force – a judge – imposing it on you. Looking for Toronto divorce lawyers? Let our Toronto Divorce Lawyers help you settle your matters efficiently. Contact Baker & Baker at 416-964-2215 or by email for more information.